#061 Jingle Bells Christmas Tree Farm! Here is the second design in my "Small Farm Series". :) There are so many wonderful small family farms near my home, and over the years I’ve wanted to stitch some of them into samplers. I designed this as a companion to Ravenhill Farm, my second small farm sampler. I’ve designed these farms in the same style as the small Victorian Garden Samplers, except that they are wider and larger. There is a wonderful Tree Farm only a few miles from my house, and I just love to see their colourful cart parked at the entrance to their drive, inviting families to come and get their Christmas tree. The layout of the farm is different, and our snow is only here for a day or two, but it’s just as cosy as the Christmas Tree farms you see in your ‘neck of the woods’! These folks help us enjoy the scent of pine or balsam in our living rooms, without harming our forests. At the top of the sampler you’ll see a log cabin covered with sparkling lights and glowing windows, a myriad of different trees, cardinals flying hither and yon are all part of the charm. The chickadees perch in the birch trees, as the sleigh bells ring, are you listening!? The Jingle Bell Farm exists in my imagination along with all the childhood memories and wishes that go along with Christmas. I’ve included many specialty stitches in the center tree farm area, and enjoyed sprinkling the entire scene with snowy specialty stitches! Parts of this design can be stitched separately, and can be used in many different ways. 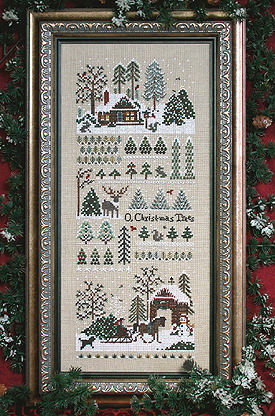 Just like in the Ravenhill farm Cross Stitched scenes, the top and bottom scenes are both wonderful as stand-alone designs, perhaps adding words using the petit alphabet (on our website in the "Good Friends" nametag in the Free Patterns) to spell out Merry Christmas, or My heart is home for Christmas. The wee trees are so suitable for that special “Christmas Memory Book”or stitched up quickly for your homemade Christmas Cards. Many motifs can easily be stitched into Christmas Ornaments or Gift Bags. I’m sure your imagination can supply lots more uses for the different elements of this cheerful sampler. 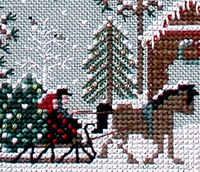 Perhaps you can make the lower part of this sampler into a stocking! the matching Ravenhill Herb Farm Sampler! ACCESSORY PACK: Ask for the Jingle Bells Christmas Tree Farm Accessory Pack at participating needlework shops. They are also available online in our Catalogue.